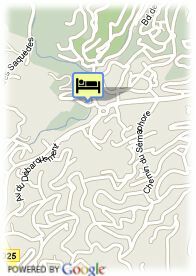 Domaine Du Golf, 83120 Sainte Maxime, France. 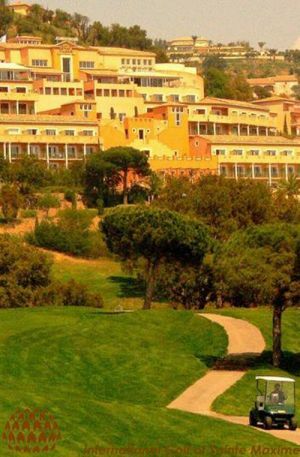 The Amarante Golf Plaza is located on the hills of Sainte-Maxime, dominating the Bay of Saint-Tropez, 5 Km from the city centre and the sandy beaches. The International Blue Green Golf Course surrounding the hotel, provides a wide panorama of nature and quietness. It offers 97 rooms including 12 Suites, all of them overlooking the Bay of Saint-Tropez and up to 8 meeting rooms is ideally located for leisure or business stays. Either the indoor heated and outdoor pools, sauna, hamman, fitness room, tennis court and SPA dedicated to beauty and wellness, or our 2 restaurants with fine cuisine will make your stay at pleasure for all senses. Come and taste the gastronomic cuisine at the Relais Provence or traditional meals at the Saint-Andrews, the Club-House restaurant located on the greens. Paid open air parking at the hotel (15.00 €). Near exhibion centre, Harbour, Near shopping centre.